– A United Launch Alliance (ULA) Atlas V rocket carrying the classified NROL-61 satellite lifts off from Space Launch Complex-41 at Cape Canaveral Air Force Station in Florida on July 28, 2016 on mission for the U.S. National Reconnaissance Office. 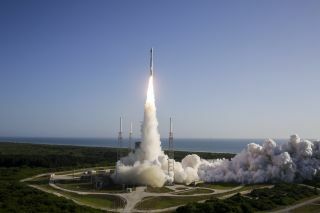 A new American reconnaissance satellite has made it to orbit to begin the latest secret mission for the U.S. government. The classified NROL-61 satellite launched into space from Cape Canaveral Air Force Station in Florida this morning (July 28) at 8:37 a.m. EDT (1237 GMT), riding into space atop a two-stage United Launch Alliance (ULA) Atlas V rocket. NROL-61 will be operated by the National Reconnaissance Office (NRO), the agency in charge of the United States' fleet of spy satellites. NRO payloads are generally classified, and NROL-61 is no exception; no information is available about the satellite's precise activities or final orbit. (ULA's brief mission description states simply that NROL-61 will operate "in support of national defense.") You can see more launch photos from the Atlas V mission in our full image gallery here. The mission logo for the classified NROL-61 satellite for the National Reconnaissance Office atop an Atlas V rocket on July 28, 2016. The United Launch Alliance launched the mission from Cape Canaveral Air Force Station in Florida. NROL-61 is the third NRO satellite to lift off this year. The NROL-45 mission launched atop a ULA Delta IV rocket in February from Vandenberg Air Force Base in California, and NROL-37 rode a Delta IV Heavy — the most powerful rocket currently in operation — to orbit from Cape Canaveral last month. The NRO chose a cartoon lizard, dubbed Spike, as the mascot for the NROL-launch, with an image of the reptile launching into space on the Atlas V.
Another mission, known as NROL-79, is scheduled to launch atop an Atlas V in December, also from Cape Canaveral. The Atlas V that blasted off today was the "421" configuration, which features a payload fairing 13 feet (4 meters) wide and two solid rocket boosters (SRBs) attached to the central core booster. The rocket reached Mach 1 (the speed of sound) 47 seconds after liftoff, and the two SRBs were jettisoned at 2 minutes and 9 seconds post-launch. The first-stage engine cut off at 4 minutes and 10 seconds, when the rocket was traveling at about 12,550 mph (20,200 km/h), according to a ULA mission video. A United Launch Alliance Atlas V rocket carrying the classifed NROL-61 satellite launches into space from a pad at Florida's Cape Canaveral Air Force Station on July 28, 2016 to begin a mission for the U.S. National Reconnaissance Office. Four minutes and 16 seconds into the mission, the two rocket stages separated; the upper stage, known as Centaur, then began firing to take NROL-61 to its final orbit. At the request of the NRO, ULA representatives cut of its live video feed from the Atlas V rocket shortly after the successful launch. The NRO was established in 1961 — four years after the Soviet Union launched Sputnik 1, the first-ever artificial satellite — and worked in secret until 1992, when its existence was declassified.